It’s Inktober, and I am participating for the first time. To start, here’s my tools of choice! Not saying I won’t turn to another inking device at some point, but let’s start with these. I drew each item with the other, which turned out to be a good decision. The Kuretake #40 ink brush laid down some intense solid coverage to reveal the hard reflections on the shiny Platinum EF fountain pen. And, the EF pen brought on incredibly fine lines to capture the matte finish of the ink brush barrel. Real winners, both of them. A little wash of background color and just a hint of purple on the Kuretake finishes this off for Day #1. The sketch is about 3″ x 5″ on Strathmore Windpower 140lb CP watercolor paper. This is the first true ink drawing I’ve done with either tool. They’ve both been used extensively for pen-and-wash work with watercolors, plus I write with the Platinum pen, but as drawing tools? TOP NOTCH. I did the EF pen first using the brush pen, and was amazed at the lines it is capable of making. So thin! I expected line width variations, but the fine lines it is capable of were a true surprise. It is by far the finest piece of art gear I have ever used. Grateful thanks to the party who provided it as a gift. The EF pen has been my ink obsession for about a year now. It’s similar to a Crowquill, but with an ink cartridge. This eliminates the need for an ink bottle obviously and makes the pen an option for everyday use. It’s a desk pen, very long and designed to look fancy in a holder. I wanted a rough-and-ready pen that could go everywhere and included an option to post the cap. Few minutes with some pliers and a Dremel tool, and job done. It’s quite short now, which I like even more. By the time the cap is posted the length and balance suit me just fine, and the smaller size is very pocket-friendly. The nib is not terribly flexible, which is also fine with me. 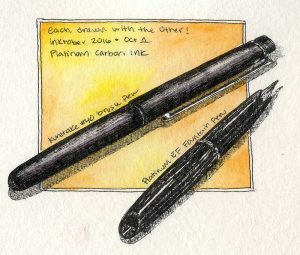 It serves well for fine-line art and everyday use, and I could not be happier with it. It really is the pen I have been looking for all my life. So, lesson #1 from Inktober: I have two tools at hand that are far more fabulous than I even thought they were. On to Day 2!